NASHVILLE, Tenn. — American Trucking Associations President Chris Spear said he is confident that the federal electronic logging device mandate will take effect on schedule on Dec. 18 after years of debate and legal challenges. That regulation will require most interstate motor carriers to record drivers’ hours of service with ELDs rather than paper logbooks, a change that Spear said will help make the trucking industry safer and more productive. The rule, finalized by the Federal Motor Carrier Safety Administration in late 2015, gave carriers two years to make the transition to ELDs. The implementation deadline is now just four months away. 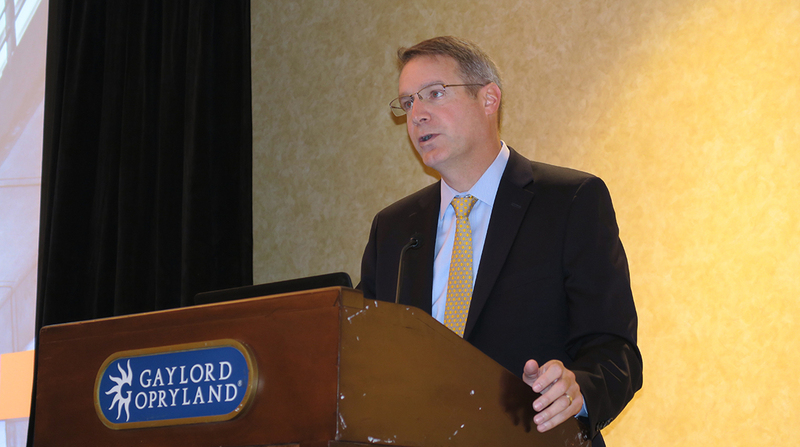 It’s “highly unlikely” that the mandate will be delayed, Spear said here Aug. 14 at the In.sight user conference held by trucking technology suppliers TMW Systems and PeopleNet. Spear pointed out that the ELD regulation was not only an FMCSA initiative; it was mandated by Congress, including a Republican majority House of Representatives, in the Map-21 highway bill passed in 2012. The ELD rule later withstood court challenges, culminating in the U.S. Supreme Court’s decision not to hear the case. Spear said ATA does have questions about the rollout, especially the enforcement plan, but FMCSA has indicated that it is on track to enforce the rule on the effective date. Beyond ELDs, the regulatory environment is shifting in Washington. President Trump’s directive that the federal government cut two regulations for each new one created has led to greater scrutiny of both existing and proposed rules within each agency, including FMCSA, Spear said. An advance notice of proposed rulemaking on sleep apnea, for example, has been withdrawn. Speed limiters, meanwhile, have been relegated to the Department of Transportation’s long-term agenda, a “clear indication” that the proposal brought forth in October was “flawed,” Spear said. He criticized the fact that the proposal listed three potential top speed limits instead of one, and didn’t specify which speed the regulators recommended. “As written, that rule is abysmal, and it deserves to be pulled,” Spear said, adding that ATA will continue to engage in dialogue on this issue. Spear also provided an update on ATA’s efforts to give commercial trucking a strong voice in shaping the regulatory framework for automated driving technology. Spear cited ATA’s hiring of Mike Cammisa, a 16-year veteran of global automakers, as its vice president of safety and connectivity. The federation also has created a subcommittee on autonomous vehicles, with members that provide input on what the framework for autonomy should look like. In addition, Spear was named one of 25 members of the Department of Transportation’s advisory committee on automation. “We took a seat at the table,” he said. Spear also said the industry needs to displace the “hype” about autonomous trucks with reality. The focus really is not on driverless trucks, but on driver-assist technologies that could make drivers safer, more productive and better rested while reducing emissions and traffic congestion, he said. ATA also continues to emphasize the need for trucking to tell its story to legislators. Those efforts could lead to action on issues such as infrastructure improvement, Spear said. The driver shortage also remains a key concern. Spear said that issue will be a “very big centerpiece” of ATA’s annual Management Conference & Exhibition in October in Orlando, Fla.